I haven’t been much of a fan of this series (this is the third in the series) but there has been just enough to keep me reading and enough that has shown promise/potential. Don Drake, our (anti-? )hero, is a loser. He’s the dregs of society and can’t do much that is right. He starts this book on the run – trying to get away from his last big f*-up and avoid facing anyone or anything connected to his screw-up. He goes so far as to fall back into heavy drug use. He’s about as low as you can go. Well … he can get lower. He can go to hell. Literally. To escape his recent past, Don runs to his deeper past and finds an old girlfriend in Scotland where he hopes for some solace. What he learns is that he is a father – has been for some time. But he hadn’t been informed because he clearly wasn’t ‘dad’ material, Still, given the things that have happened to him, he takes an interest in his progeny. But so do others. New to this book is a character by the name of Davey. Davey could be an older version of Don himself … worn-looking, foul-mouthed, impertinent. But Davey’s got a little bit of a secret that you’ll have to read the book to discover for yourself. This revelation is enough in itself to warrant a read for the next volume! What works for me with this book is that there’s just enough growth here – both in the character development and in the author’s own writing ability – that I begin to care a little bit about these people. The relationships have become clearer and the Burned Man demon holds some fascination for me. He (it?) did before as well, but now I feel as though there may be something coming through that will interest me beyond this volume. Combine this with what we come to know about Davey and I’m definitely in for the next volume. This is raw and gritty urban fantasy and there’s nothing wrong with that, but I still feel there’s better raw and gritty urban fantasy out there so this isn’t topping my recommendation list, but it’s definitely improving. Looking for a good book? 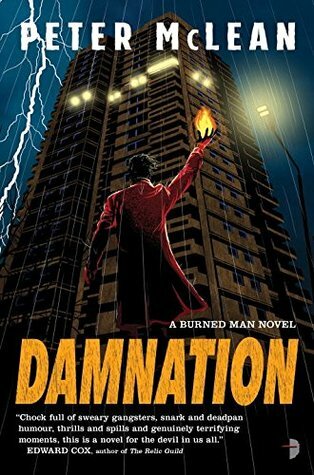 Damnation by Peter McLean is the third in the Burned Man series and shows that the series is improving.